Renee Henn is a professional flutist and flute teacher in the Los Angeles area. Renee was born and raised in Malibu, CA, in a very musical family. She began playing the flute at the age of 7, taking lessons from her mother, a notable session player in Los Angeles. From grades 6-12, she was a member of the Malibu High School orchestra, wind ensemble, and jazz band, while also performing in musicals such as “Thoroughly Modern Millie”, “Aida”, “Crazy for You” and “Sweeney Todd”. During this time she began playing the piccolo, alto and bass flute. 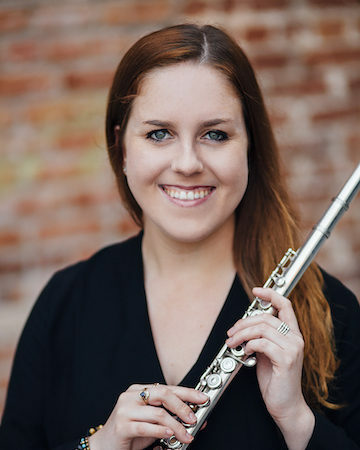 Renee received her Bachelor of Arts degree in Flute Performance from UCLA in the spring of 2016, where she studied under Sheridon Stokes. She played principal flute in the UCLA Philharmonia, Wind Ensemble, Symphony, and in multiple UCLA chamber ensembles. She also performed and participated in the Beverly Hills International Music Festival in 2013. She currently performs with the Conejo Valley Flute Society, Duo Pacifica, the Song of Angels Flute Orchestra, and the Palisades Symphony. She has recently formed her own chamber orchestra called the “Burbank Chamber Music Society”, with multiple UCLA orchestral musicians. She is actively involved in music education, and has taught flute to students of all ages.